Key provisions of the Biggert-Waters Flood Insurance Reform Act of 2012 (BW-12) are beginning to be phased in including the elimination of some of the artificially low rates and discounts that many local homeowners currently enjoy. This change in law may result in some policyholders having their subsidy eliminated. Specifically, the legislation will require rates to increase to reflect true flood risk and to help make the program more financially stable. The changes will mean premium rate increases for some – but not all -- policyholders over time. Not everyone will be affected immediately by the new law – only 20 percent of National Flood Insurance Program (NFIP) policies receive subsidies. Contact your insurance agent to help you understand if your policy is impacted by the changes and if it it could affect your policy premium. In order to determine the new insurance rate for each property, insurance companies are requiring Elevation Certificates. To obtain an Elevation Certificate, the property owner needs to hire a surveyor. Anyone needing assistance finding a surveyor can contact the Engineering Department at (847) 671-8304 . The Elevation Certificate will demonstrate the risk of flooding for the building. Once the Elevation Certificate is obtained, it is recommended that the property owner provide the Engineering Department a copy. The Elevation Certificate will be placed in the file for the property and the engineers will review it to determine if they believe the building can be removed from the floodplain. 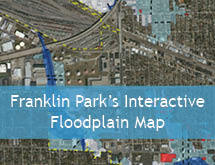 The below maps can be used to determine if a particular property is located within the regulatory floodplain. The Village uses them to regulate development. 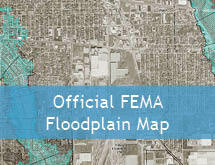 Properties located within the regulatory floodplain are subject to special requirements, which are outlined in the Village’s Floodplain Ordinance (Title 8, Chapter 5). There are also additional regulations from other regulatory agencies depending upon the scope and location of the proposed work. Lenders and Federal agencies use them to determine when flood insurance is required as a condition of a loan or financial assistance. If you have any questions regarding floodplain regulations or require a written letter of determination from the Village stating the flood zone of a particular property, please contact the Engineering Department at (847) 671-8304.